leader Ayman Zawahiri, to top Sunni cleric Sheikh Yusuf al-Qaradawi—made a point to single out Egypt’s Copts as especially instrumental in the ousting of former Islamist president Morsi, a claim that ushered in a month of slaughter against the nation’s Christian minority. until recently. Dozens of Coptic homes and businesses were also attacked, looted and torched. looted before being torched. In Moribadou, the violence lasted three days and saw at least 10 churches destroyed. congregations, says the text, “increase unabated… The behavior of local authorities is a potential threat to the tolerant atmosphere we see deteriorating over time.” Behind this upsurge is the current governor of Aceh, Zaini Abdullah, who earlier spent years in exile in Sweden for his separatist activities. During his election campaign, the Islamic politician frequently said that “he would not hesitate to apply the Koranic laws in the province.” Months after his victory, those words have become reality. and an explosion apparently targeting Peniel Baptist Church failed to affect the building. Pakistan: Asia Bibi, a Christian mother on death row since June 2009 for allegedly blaspheming Islam’s prophet Muhammad, may have to wait another two years before the appeal against her blasphemy conviction is heard. In November 2010, she was sentenced to death.The chairman of the Human Liberation Commission in Pakistan has been lobbying the country’s chief justice for Asia’s appeal to be heard as soon as possible but has received no response. Also, a Christian couple was arrested for allegedly sending blasphemous text messages to a Muslim cleric in Gojra, where a week earlier a young Christian man was sentenced to life in prison on the same charge. Shafqat Masih, 43, and his wife Shagufta, 40, who have four children between the ages of 5 and 11, were taken into custody on a complaint by Muslim cleric Rana Muhammad Ejaz, who alleged that he had received blasphemous text messages from Masih. Gojra City police registered the case under Section 295-C of Pakistan’s widely condemned “blasphemy laws” against defaming Islam’s prophet, Muhammad. Conviction is punishable by death or life in prison (in Pakistan, actually 25 years). abducted. According to the Assyrian International News Agency [AINA], “The truck was booby trapped with explosives, and it is believed that he was forced to carry out a suicide bombing, but refused to do so. The kidnappers had contacted Mr. Coca’s family but had not demanded a ransom and described him as a ‘Christian infidel. '” Mr. Coca leaves behind a wife and several children. al-Assad—most likely for ransom or beheading. ·At least 28 were killed in a series of explosions throughout a Christian neighborhood in the Muslim-majority northern city of Kano. The attacks happened in the evening while people were out “to enjoy the area’s nightlife.” The same neighborhood had been targeted in the past by Boko Haram, which is responsible for killing more than 2,000 people. Although several nations have designated the group a terrorist organization, the current U.S. government refuses to do so, even as several American policymakers push for the designation. 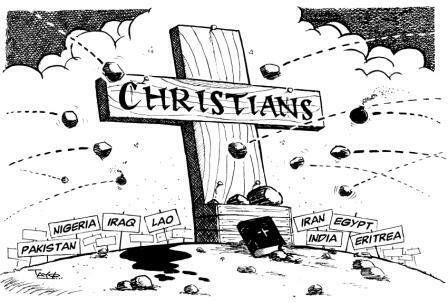 Islamic gunmen, as has become increasingly common, raided the Christian village of Dinu, in the southern Plateau state, before church services on an early Sunday morning, and slaughtered six Christians. A month earlier, Muslim Fulani herdsmen had shot another Christian to death in a nearby village and destroyed the churches of four villages. Yes, but our president has just said none of these people are terrorists — so I guess they are eligible for immigration to the US. Wouldn’t that be great — additions to the Moslem fanatics we have already admitted to this country.